I'm thankful for my amazing whiskers and floofy tail. They get me out of trouble when I've opened all the drawers in the bedroom looking for treats. I'm thankful for the kitchen and all the yummy stuff it contains. Does this angle make my hips look big? I thought black was supposed to be slimming. I'm thankful for sunshine, a warm bed, and cuddles. And every now and then, a soft rug to pee on. I'm thankful for Dr. Long and the entire staff at Banfield for taking such good care of me. I'm very thankful for my daddy. He's the best daddy in the world. I'm thankful for calming treats and that the annoying tweeting track-ball toy the cats use to freak me out has been moved to the basement. We're all very thankful for our readers and fans. Thanks for loving all of us and we wish you a joyous and peaceful holiday season. We had been gone most of the day to take Mom to visit her sister. The cats, as usual, had full run of the house. We got home late that afternoon and everything seemed fine. All of the kitties ate dinner like normal, nothing seemed amiss. 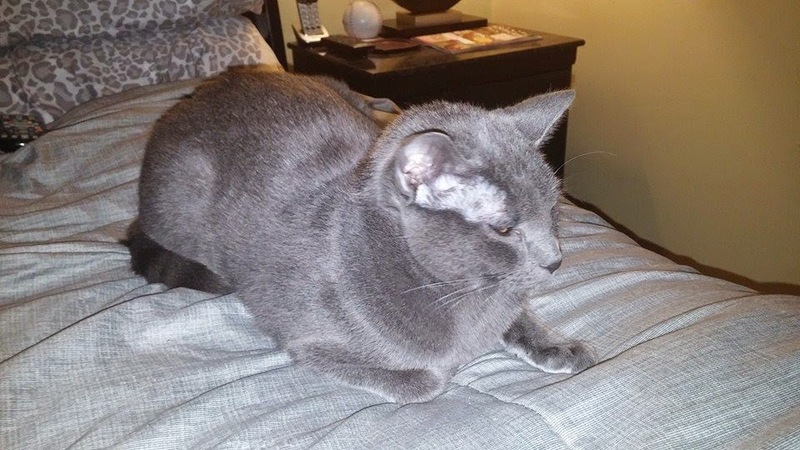 Later in the evening I was in my bedroom and Stilwell was with me, laying on the bed. I didn't notice anything was wrong until I gave him some treats and he only ate a couple of them. Usually he inhales them and digs around in case he missed any. That is when it hit me that he was not his normal high-energy self. I tried to offer him a bite of turkey and he ignored it. That's when I knew something was wrong. 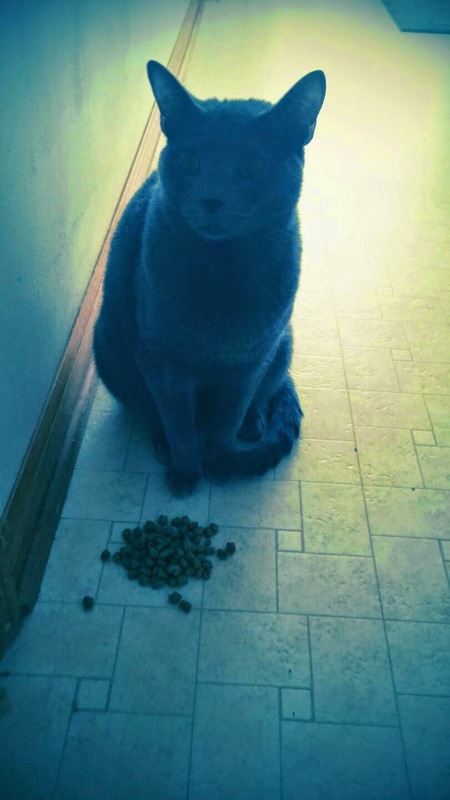 Our blue boy never passes up food. I decided that I would call the vet the next morning. Stilwell went downstairs at breakfast time, but when Lee put his bowl in front of him, he just sniffed it and walked away. The same thing happened at lunch. I called the vet, but we couldn't get in that day so we made an appointment for Monday. I headed to the grocery store to find something that might interest him. 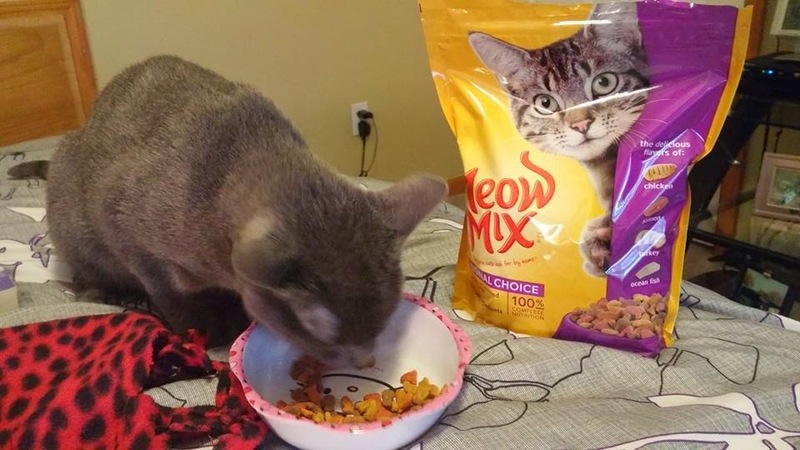 I bought a couple packets of Fancy Feast Broths, some meat baby food, and even crack (better known as kibble, in this case, Meow Mix). When I got home I took Stilwell up to the bedroom so I could closely monitor his intake and output. I didn't want to have to fight the other cats off from his food, either. 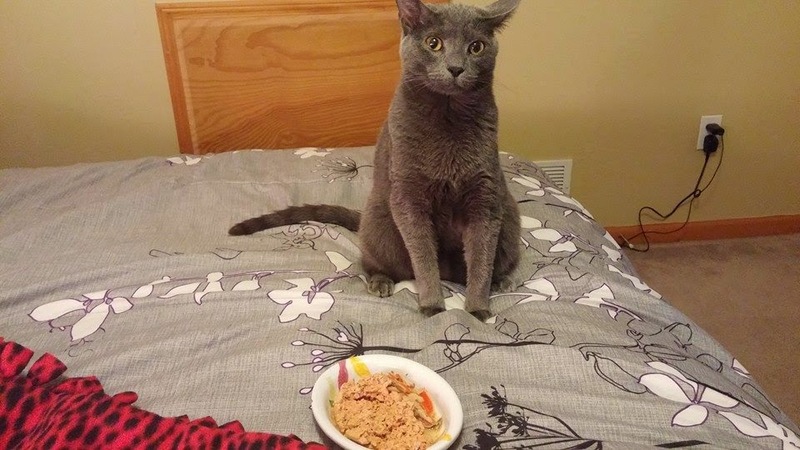 I first tried the kibble and was thrilled that he ate some. It wasn't much, but anything in his tummy was good. About an hour later, I opened up one of the pouches. He licked up all the broth, but didn't eat any of the meat. That was okay, too since I was worried about dehydration. He had only drank a small amount of water so the liquid from the food was helpful. He spent the rest of the afternoon napping. He didn't even change positions much. I could tell he was running a fever, but I had no idea what to do for that. 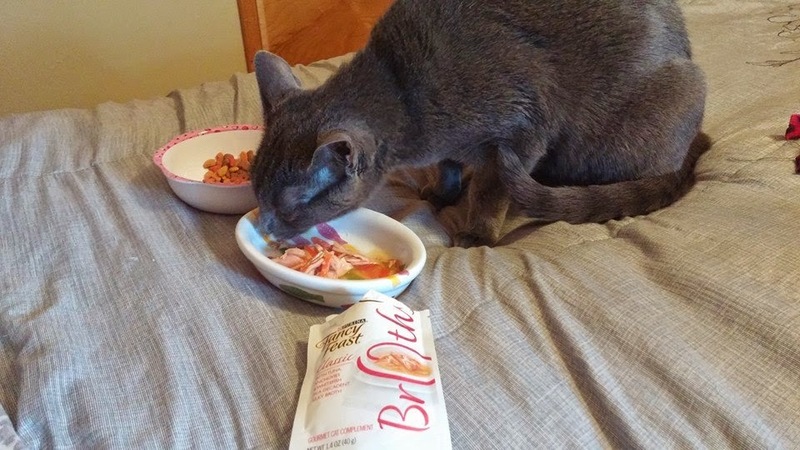 Dinner time rolled around and I tried canned food. Again, he gave it a sniff and ignored it. I offered him a couple of teaspoons of ham baby food and he licked almost all of that up, but that was all he wanted. I offered him more crack but that was a no-go. I heated the canned food. Still nothing. 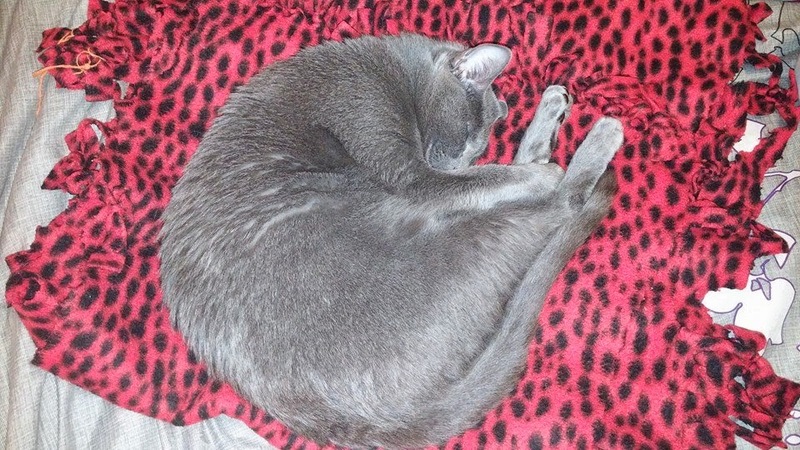 He laid back on his blankie and slept some more. Around midnight he woke up and vomited a small amount of bile, then went back to sleep. All this time, Lowenstein was outside the door, begging to come in. He cried loud and he cried hard. Being the emotional boy he is, he ended up peeing on the bathroom rug that night. Stilwell drank some water and peed, which made me very happy. 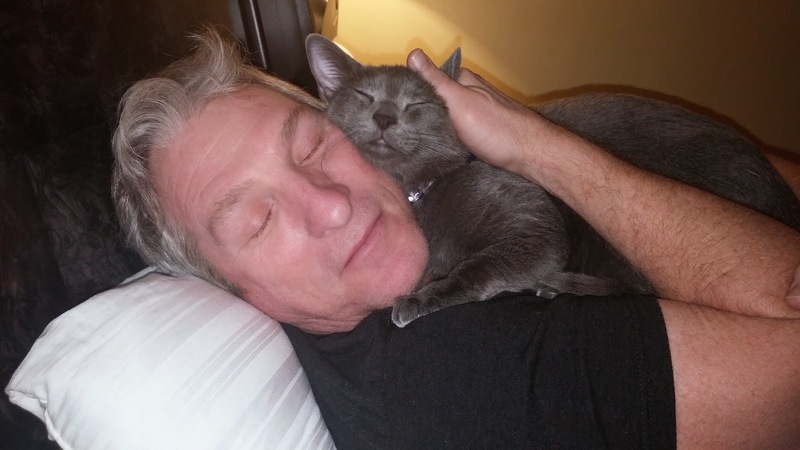 He cuddled with his daddy until his vet appointment at 11:30. When we got to Banfield, Stilwell's favorite vet tech, Andi, took his temperature and it was quite high: 103.9. She went ahead and ordered bloodwork and urine and suggested the vet may want to do additional tests like x-rays and the test for pancreatitis (which she did). We ended up having to leave him there for the day so they could give him fluids and run the tests. 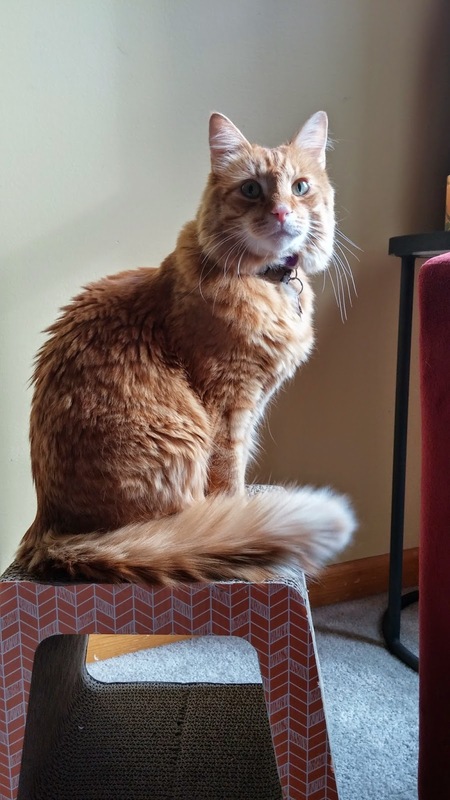 The pancreatitis test came back positive, so they started him on antibiotics and pain meds. She didn't see anything obvious on the x-ray that would show a foreign body (which had been my biggest fear) but wanted it to be read by the experts before beginning him on anti-nausea meds. Luckily, the x-ray came back clear and they were able to get those meds in him too. At that point, the vet wanted him to stay until closing so they could monitor him. When we went to pick him up, his temp had only gotten down to 102.5. He hadn't eaten anything, either. Dr. Long wanted us to bring him back the next morning so they could give him some more fluids and work on getting his fever down. 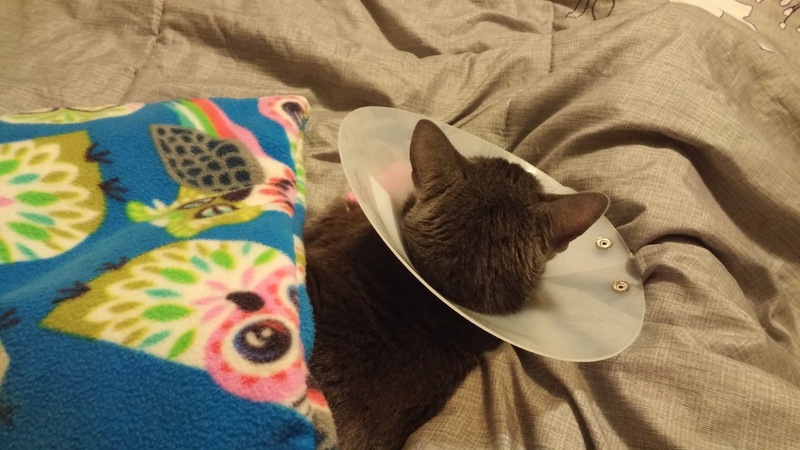 She left the catheter in his leg and put a cone on him so he couldn't mess with it. Once home, I offered Stilwell some canned food and he went right for it. He ate about 3/4 of a small can. After eating, he slept for the rest of the night. Lee took Stilwell in first thing in the morning and they got him going on fluids again. When he went back in, his fever was back up to 104, but by midday it was down to 102. 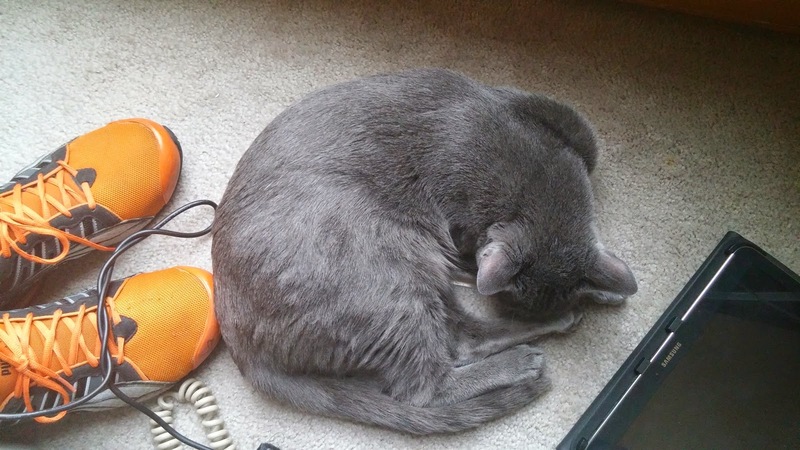 When I called to check on him, they said he was really mellow. I picked him up at closing again and at that time his temp was down to 100.2. 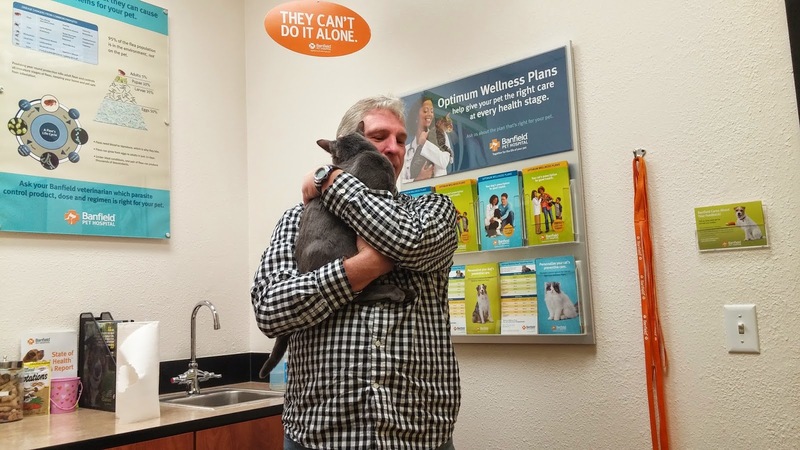 The vet was very happy with that, but to be sure everything was okay, wanted me to bring him back the next morning to check his temperature to be sure it had stayed down. They sent me home with his antibiotic and pain meds, again leaving in the catheter and the cone. He chowed down on dinner when we got home and he peed. He walked around the room checking things out-he was definitely feeling better. I gave him his meds and he settled in for the night. I took Stilwell to see Dr. Long this morning and the news was good! His temp was down to 99.2. No more vet stays for him! 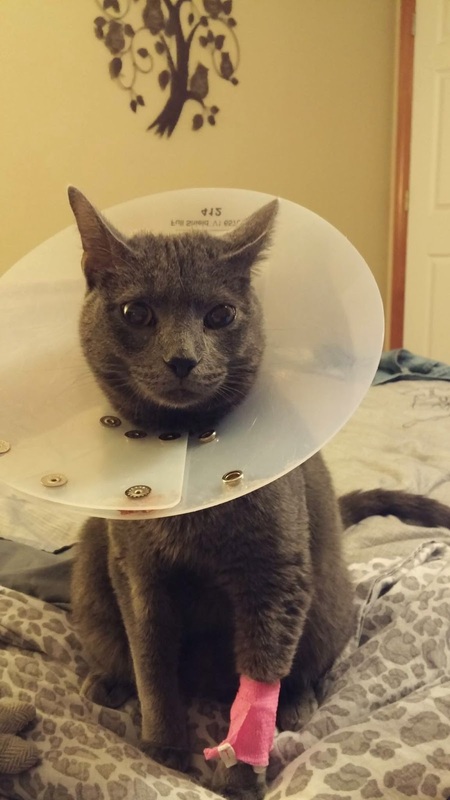 The cone came off and the catheter came out. Since being back home, he's done great. He's taking his meds like a good boy and he has eaten. He still isn't eating as much, but that's to be expected. He's also sleeping a lot, but he needs his rest so he can recover from all of this. He took the prime sleeping spot on a cold day: right on top of the furnace vent! We would like to thank everyone for all of the good thoughts, purrs, and prayers. They certainly kept me upbeat through the last few days! Cat Quotables-How Do You Treat Cats? I was so taken with the subject of this bonus post that I knew I would have to write about her, too. I'm pleased to introduce Crystal. 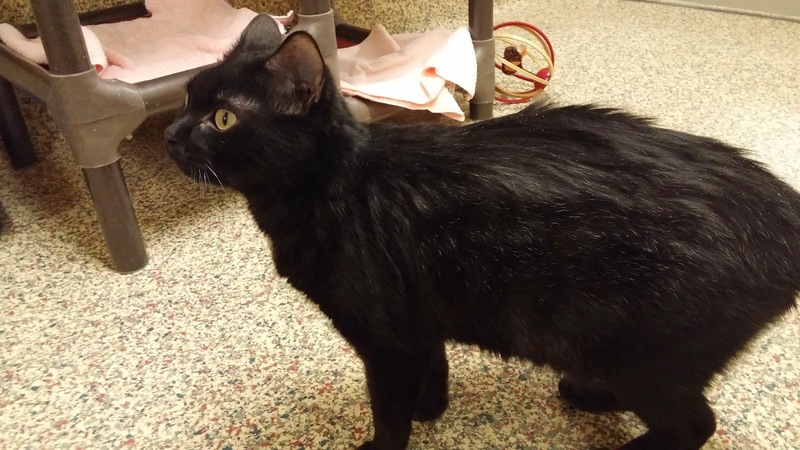 Crystal is up for adoption at Great Plains SPCA in Merriam. She is 5 years old and is front declawed. 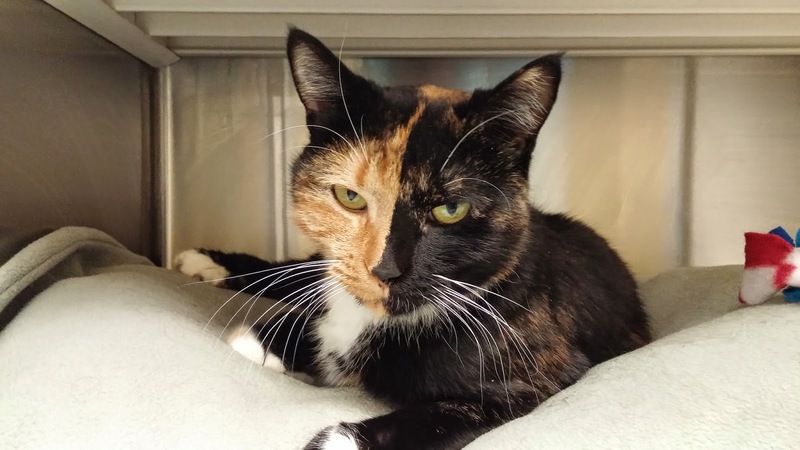 Then of course, you have her amazing coloring. When I first saw Crystal, I was immediately reminded of Venus the Chimera Cat. I'm not sure what causes these striking markings, but I'm in awe of her beauty. Crystal was very friendly, too. She loved having me pet her and scratch her head. She also politely told me when she was done and that it was time for me to stop. 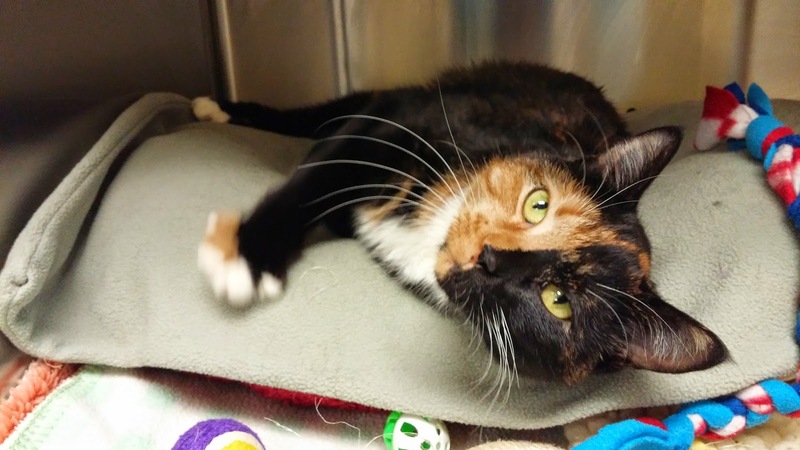 She is certainly not your ordinary calico. 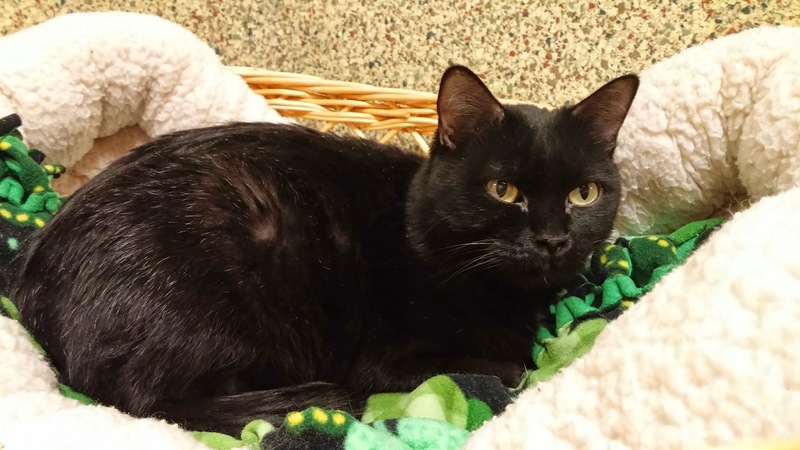 If you'd like to see Crystal in person, you can visit her at Great Plains SPCA located at 5424 Antioch Drive, Merriam, Kansas. 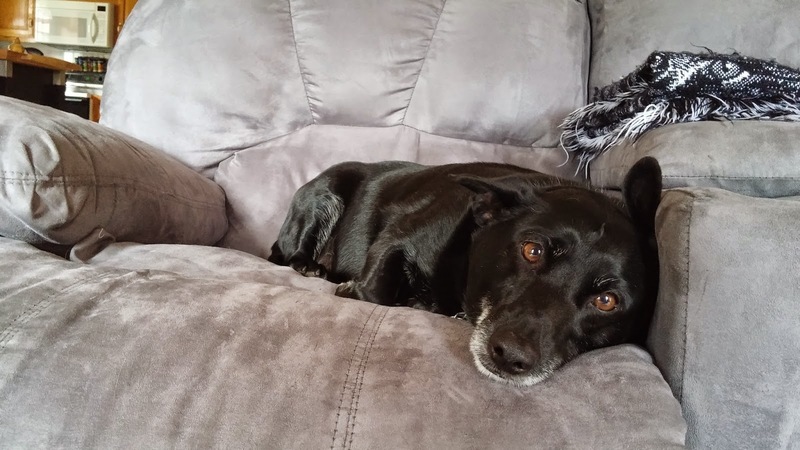 UPDATED: CRYSTAL FOUND HER FOREVER FAMILY ON SATURDAY NOVEMBER 22, 2014! 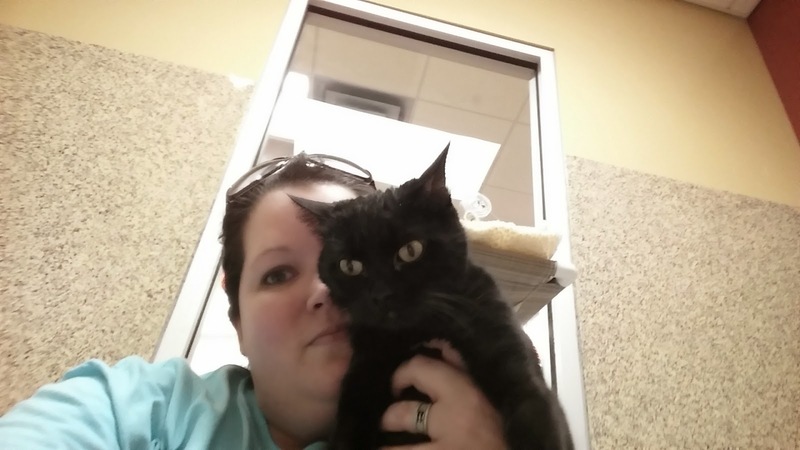 I met a sweet little housepanther at Great Plains SPCA in Merriam yesterday. 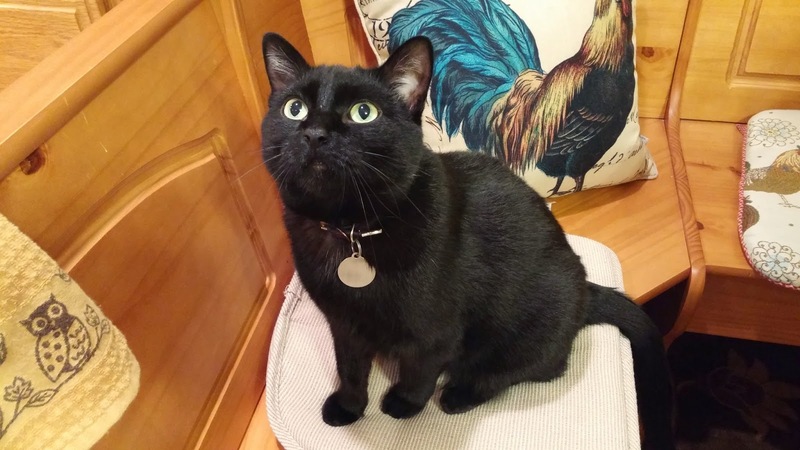 She's on the petite side and has a sprinkling of white hairs on her body with a white patch on her chest. Her name is Sabrina. 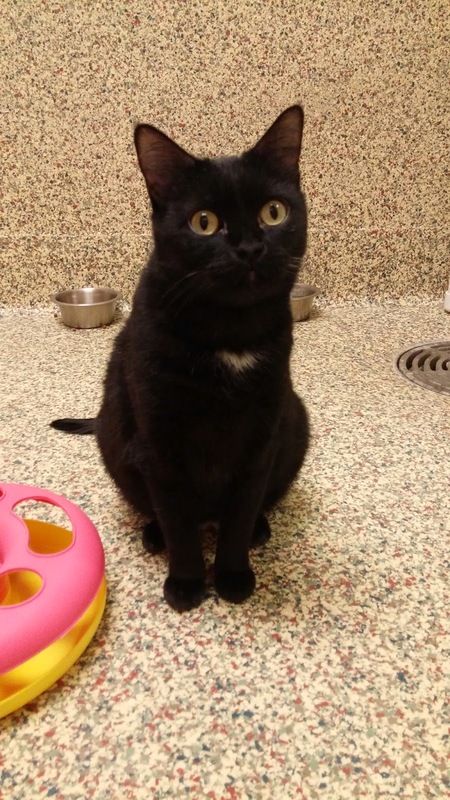 Sabrina is 4 years old and came in to Great Plains as a stray. She came right up to me when I sat on the floor and began to purr as soon as I began petting her. She was immediately comfortable with me in the room and didn't show even the smallest hint of shyness. Sabrina even let me pick her up so we could take a selfie! Isn't she the sweetest thing? 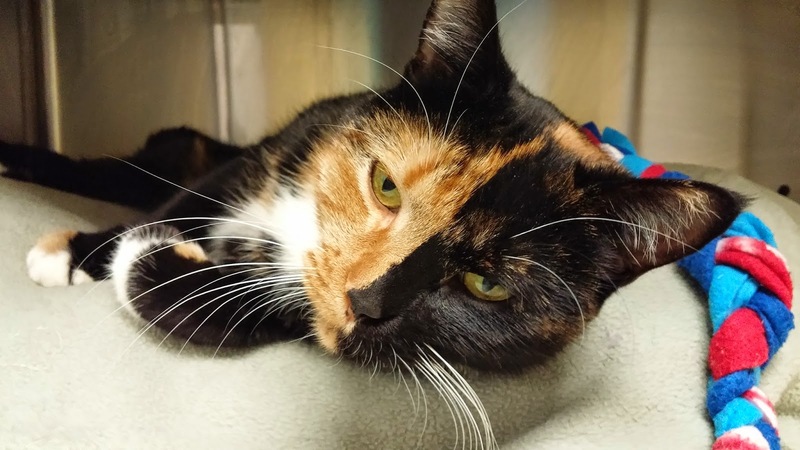 If you're interested in meeting Sabrina, you can visit her at Great Plains SPCA located at 5424 Antioch Dr., Merriam, Kansas. The holidays are here! I love to share the holidays with all the furry members of my family, but I also know it's important to keep them safe. In fact, we're taking an extra step this year with our Christmas decorations. We're trading in all of our hand-blown glass ornaments and will instead use soft ornaments that can't be broken by the cats, thus possibly causing them harm. An outtake from last year's holiday photo shoot. For more ideas on how to keep your pets safe during the holidays, you can join in the #HappyPawlidays pet safety chat on Twitter this Wednesday, November 19, 2014 at 8:00 pm EST. It will be hosted by Dr. Cindy Bressler, the veterinary consultant for Wellness Natural Pet Food. Be sure to follow @DrCindyBressler and @wellnesspetfood on Twitter and remember to use the hashtag #HappyPawlidays for the chat. They'll be hanging out for an hour exchanging pet safety ideas, it should be very informative! While I was at BarkWorld in Atlanta a few weeks ago, I picked up several books. The first one I read is a dog advice book by Dean Koontz' dog Anna. It is titled, appropriately, Ask Anna: Advice for the Furry and Forlorn. 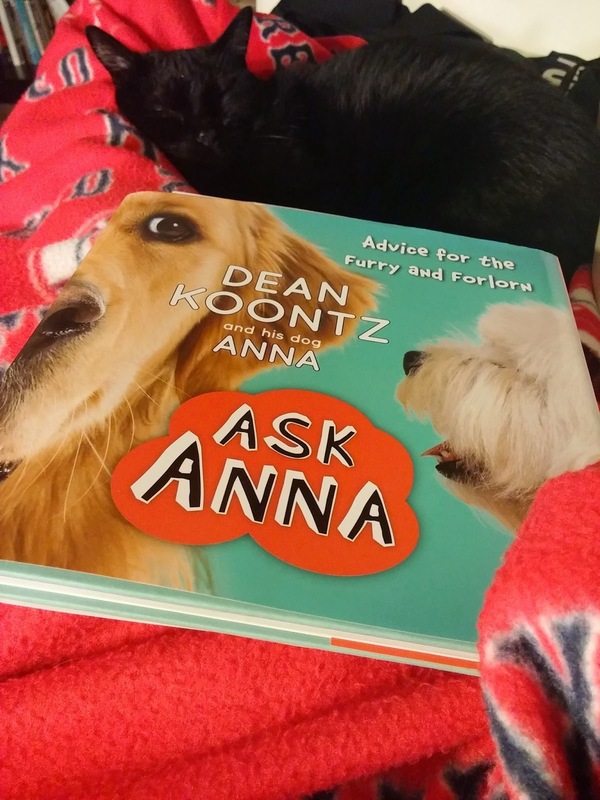 Dean Koontz is best known for his suspense novels (maybe you've heard of Odd Thomas) but Anna has taken a different path with her writing and is doling out canine advice. Anna is a Golden Retriever who flunked out of school with Canine Companions for Independence. She explains in the book that birds were her "undoing." Anna gives advice to the dogs who write to her with questions about life. She reminds them that size doesn't matter, everyone has a talent, and tennis balls are symbols of joy. She seems to only have one adversary and that is Pierre, the postman's poodle. Evelyn thinks, "Silly dogs. Cats don't need advice." Since Anna spent time at Canine Companions for Independence, all author proceeds are being donated to them! To get your own copy for free, you can enter our giveaway. All you have to do is comment and tell us who you think would benefit from Anna's advice. 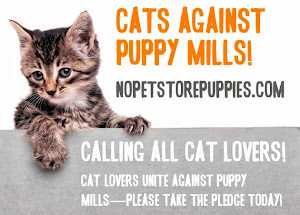 I know this is a mostly cat blog, but a lot of you have pup friends, too. Maybe a dog friend in your life could use a holiday gift! You can gain an additional entry by tweeting about the giveaway as well. You've got a week to get your entries in! The cat has nine lives: three for playing, three for straying, and three for staying. 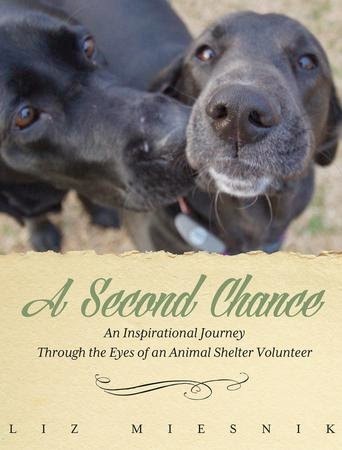 Liz Miesnik really pulls the heartstrings in her new book A Second Chance: An Inspirational Journey Through the Eyes of An Animal Shelter Volunteer. The book may be simple-photographs of beautiful shelter pets combined with inspiring quotes-but it is powerful. Ms. Miesnik states in the introduction that she wants the book to inspire and motivate people to make a difference. Already a shelter volunteer myself, I was very moved by what I saw between the pages. The cats and dogs depicted were all adorable, but there were also photos of volunteers. It came through loud and clear that they were doing what they loved. Every turn of the page brought a picture of a different pet and a new quote. Some quotes I had heard before, others I had not. My favorite was from Albert Schweitzer, "Until he extends the circle of compassion to all living things, man will not himself find peace." It accompanied a photograph of a differently abled dog named Hope. She had a wheelchair and was wearing a diaper, but the look on her face told you she didn't let any of that slow her down. At the end of the book, Ms. Miesnik introduces us to the rescues she visited to get the photographs. She is donating part of the proceeds from the book to those rescues, so just in buying the book, you're giving to them. The book does have some editing mistakes that to me were glaring, but I didn't let that overshadow the warm feeling I got from reading it. It brought so much joy to see the sweet faces of pets awaiting their forever homes and to know there were many volunteers out there giving them the love they need until they get there. UPDATE: Liz contacted me personally and asked if I would point out the editing mistakes I found. I replied and Liz is going to make the necessary corrections so that future copies will be corrected. Now that's dedication! This book was provided to me for free by the author in exchange for an honest review. All thoughts in this post are my own. We skipped breakfast on this day, opting instead to sleep in. Since lunch was served early at the conference it wasn't like we were going to starve. Lunch turned out to be BBQ. I'm not a huge BBQ fan, but I live in KC, so I know BBQ. We could choose from pulled chicken or pulled pork (I opted for chicken) and there were traditional BBQ sides: potato salad, cole slaw, and mac & cheese. The chicken was really good; I was impressed. The slaw was good, nothing spectacular. The potato salad was definitely not my thing. Frankly, if it's not Mom's, it's not my thing. We were eating in the main conference room that also served as the dining area. Lunch was scheduled from 11:30 to 12:30, so we had plenty of time to eat...or so we thought. BarkWorld had scheduled a session in that room to start at noon. Can you say awkward? We're all chowing down, chatting away, and they start a session! We finished our meal quickly and left. The only session I attended the whole weekend was an Author's Panel. I was hoping to see my friend Joanne from The Tiniest Tiger speak on this panel, but she ended up not being on the panel. It was still an informative session and I was glad I attended. It was a rough start though. The session was held in the same conference room I described above. Hotel staff had not bussed or cleaned off many of the tables and it was kind of gross. It was also late to start, which was frustrating. After the session ended, I had a little time before the awards ceremony to wrap up the conference. I chatted with a few people before going back into the main conference room. Not many people showed up and there weren't very many prizes given away. There was really no big prize either. 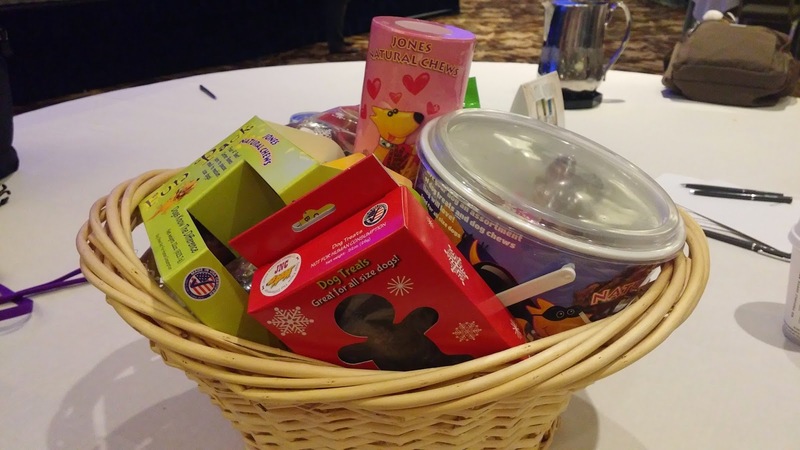 The good news was that I won a leash from K9 Carry All and a cool gift basket from Jones Natural Chews. Yaz is going to have treats for the rest of the year! Connie and I then went to dinner at the mall with a few other cat ladies. We chose California Pizza Kitchen and it was great! 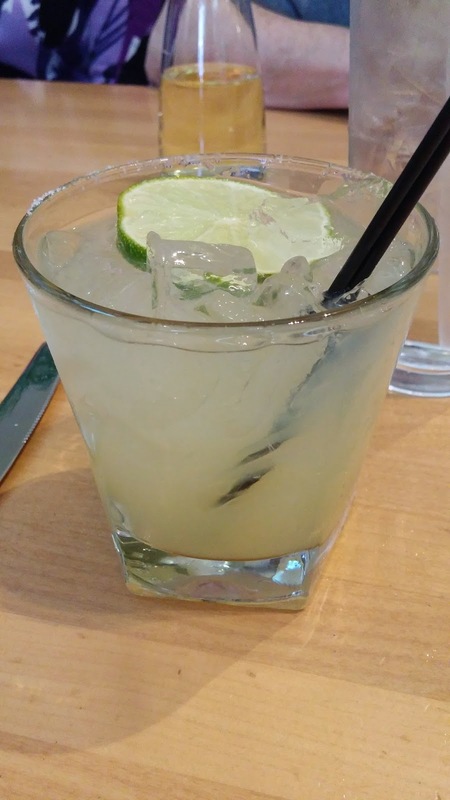 I ordered what I think is probably the best margarita I've ever tried. 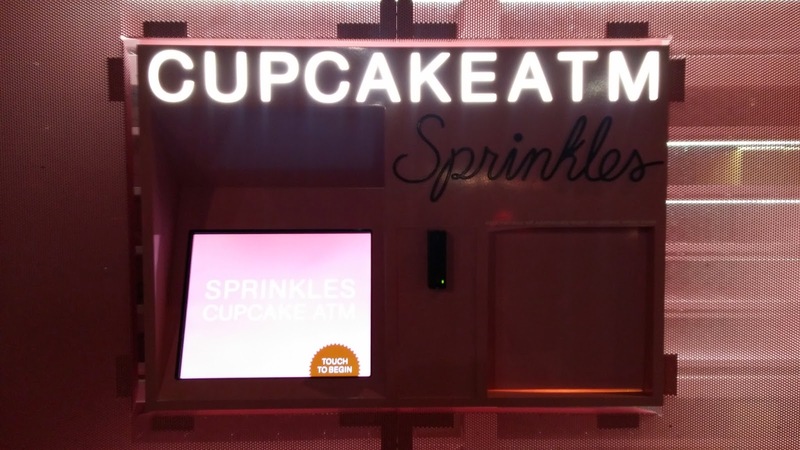 After dinner we stopped by the Cupcake ATM at Sprinkles Cupcakes for dessert. That place may have been the highlight of the weekend! We went back to our room and waited for Lisa and Debbie to get done with the banquet they were attending. Once they got back to their room, Connie and I joined them to hang out while they packed and spend one last evening with Waffles. The next morning it was time to go home. The four of us rode to the airport together. After dropping off Lisa and Debbie, Connie and I returned the rental then checked our bags. We had plenty of time to kill, so we decided to eat. We came across an IHOP Express where I had lunch and Connie had breakfast. We made our way to our gates when we were done. We hung out until it was time for us to board (our flights were only 5 minutes apart). Saying goodbye is always bittersweet. I was excited to get home to see my hubby and kitties, but a weekend with friends was ending. It was definitely worth going to Atlanta. I was so very impressed with the people there. Everyone was so nice! People think we're nice here in the midwest, but let me tell you, we don't come close to the southern hospitality I found in Georgia. It's a place I wouldn't hesitate to visit again. That being said, I doubt I attend a BarkWorld conference again. It lacked organization and the sessions were not interesting to me at all. I was disappointed since my understanding is that it had been a great conference in the past. I'm planning to attend BlogPaws next year in Nashville. It will be wonderful to see my blogging pals again! 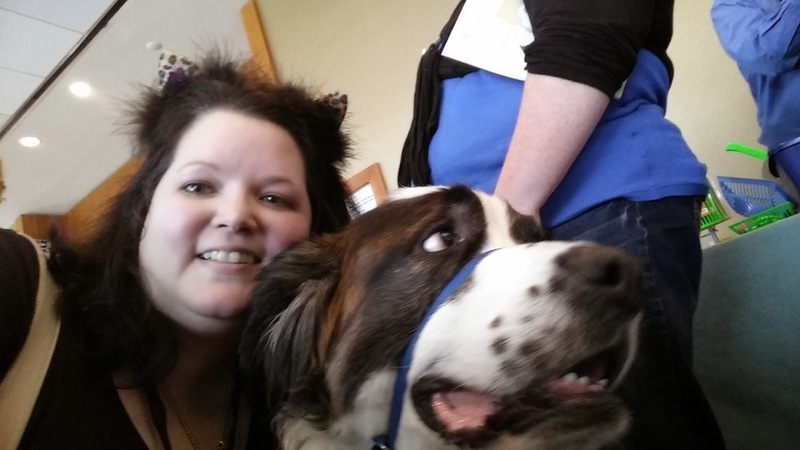 Last Friday was my second day at BarkWorld in Atlanta, but was the first day of the conference. 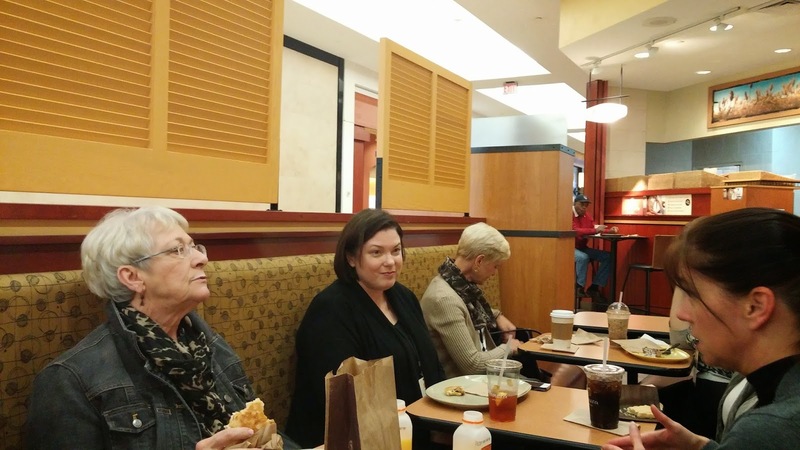 Many of us started the day with breakfast at Panera in the mall across the street from the hotel. 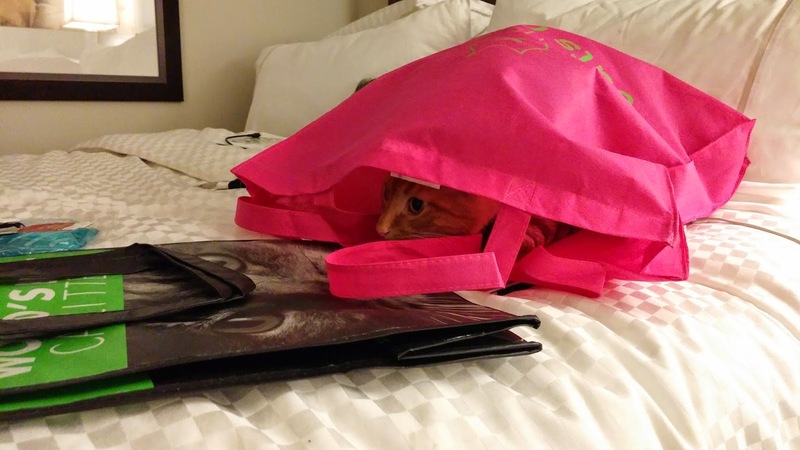 When we returned to the hotel, Connie from Tails From the Foster Kittens and I checked in at registration and picked up our swag bags. You had to choose from either a dog or a cat bag. What about if you're bipetual like me? I went with the cat bag since I have 4 cats and only 1 dog, but a combo bag sure would have been nice. It was interesting though, the cat bag ended up being cooler and having more swag than the dog bag (they had lots of extras on the last day, so I got one of those too.) Another weird thing about the bags: the cat bag had poop bags and holders in them, but the dog bags didn't. Very odd. We then walked around and visited the vendors. There weren't many there, so it didn't take long even after we spent time with each one. One of the tables housed some brightly colored artwork created by a lovely woman from Australia, Carole Stevens Bibisi of Art Harmony Creations. I purchased one of her pieces and made sure to tell others about her. Her work was beautiful! 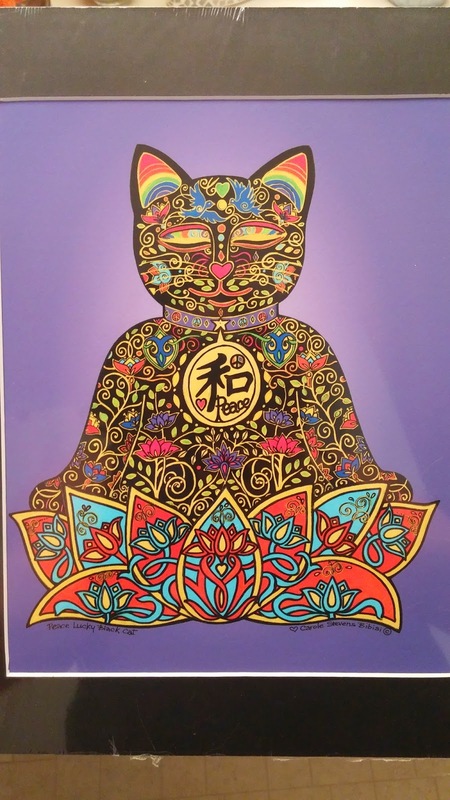 Check out the piece I bought, titled "Peace Lucky Black Cat." While walking around, I got my big-dog-fix as well. I met Koda and Ossian from theOKdogblog. Ossian, a St. Bernard, stole my heart. There's nothing better than letting a big dog love on you. Lunch time rolled around and I was kind of excited. They were serving fajitas! You had your choice of steak or chicken, along with rice, beans, and guacamole. I LOVE Mexican food, so I was happy with the offering. Until I started to eat. It was cold. In fact, the guac was still icy from being frozen. Big thumbs down on the food. I also discovered that Atlanta is Coke-land. No Pepsi to be found. Since I practically mainline the stuff, I had to make a trip to Target to pick up a 12-pack. *snort* Had to. Like anyone has to twist my arm to go to Target. This was no ordinary Target. It was 2 stories. I've never seen such a thing! 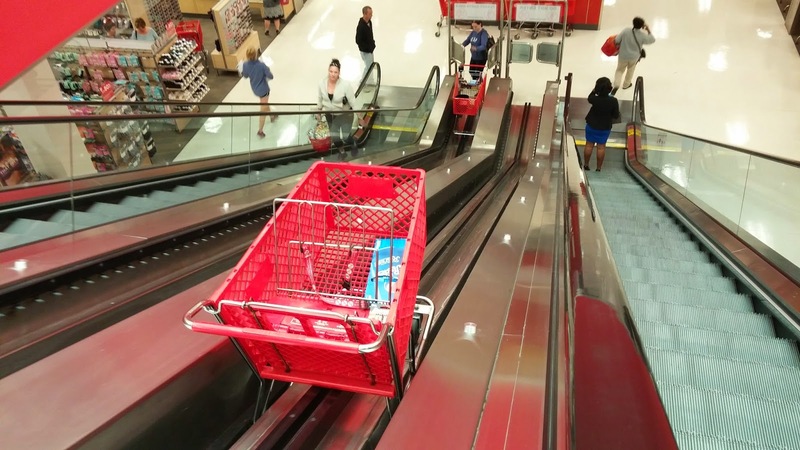 And what happens when it's time to get on the escalator to go to the other floor when you're pushing a cart? 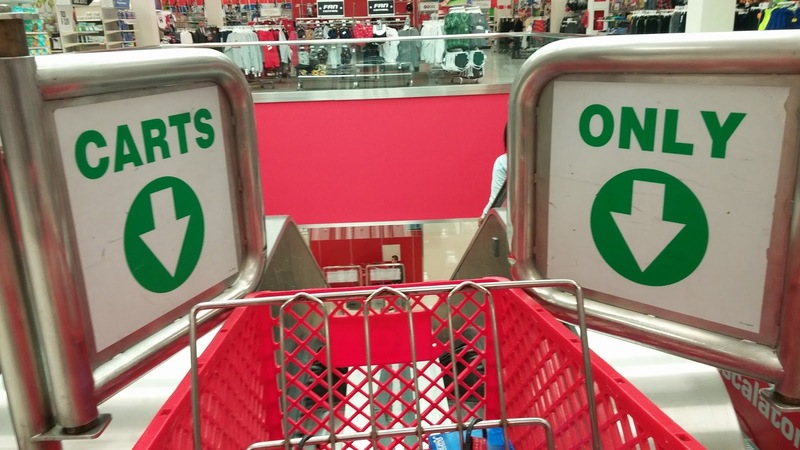 Well, you put it on the cart escalator, of course! Later that evening, Waffles was hosting a happy hour in his room. Connie and I waited for a while to go down because we knew it would be crazy and we had already had a chance to try the Mad Kitty cocktail and hang with the Waff. Happy hour in Waffles' room. 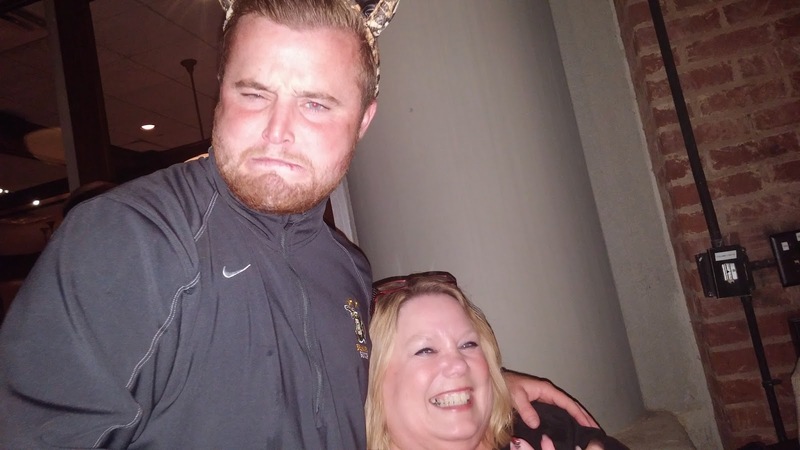 When we went to his room, he was feeling a bit overwhelmed so his mom Debbie asked if he could come to our room to relax while the party wrapped up. Twist my arm again. I think he liked hanging out with us. Once the party was over, we headed out to dinner. It was raining a bit, but that didn't ruin our fun! We walked a couple of blocks to Maggiano's Little Italy. 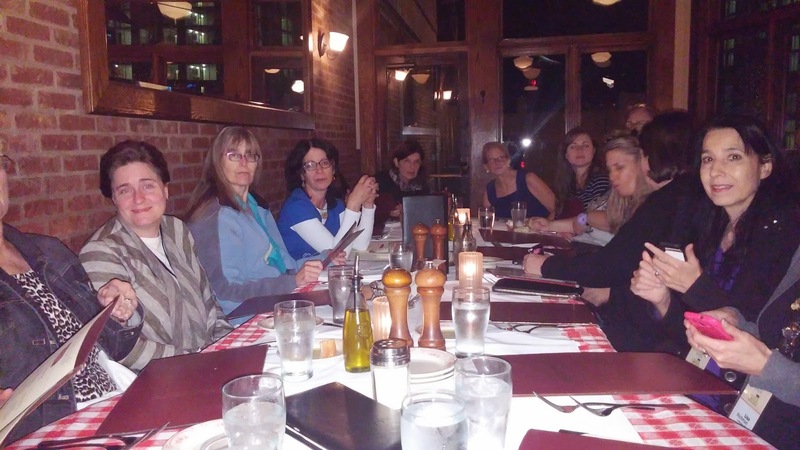 We had a table full of cat ladies, but we weren't the only big group. There was also a large group of young men sitting in the same room. It turned out they were a soccer team from Belhaven University in Jackson, Mississippi. We were two very different groups, but that didn't keep us from, uh, making friends. Paula Gregg initiated the whole thing! I swear! What can I say? Cat ladies are really nice! Check back tomorrow for my Day 3 wrap-up. 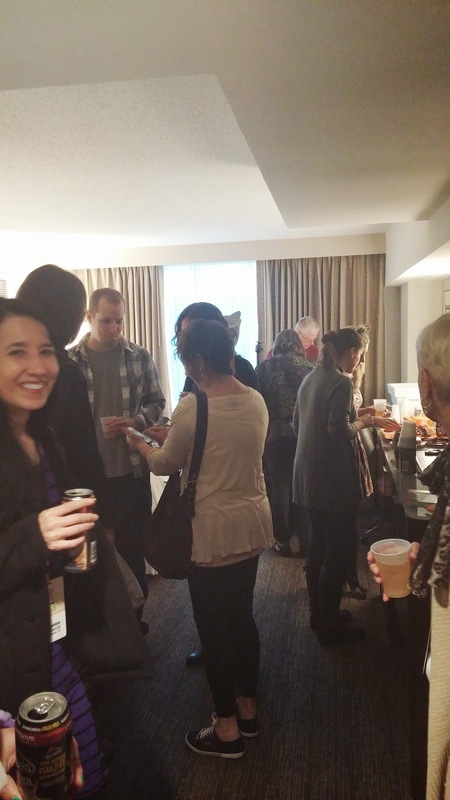 This past weekend I attended the BarkWorld Pet Blogging Conference in Atlanta. 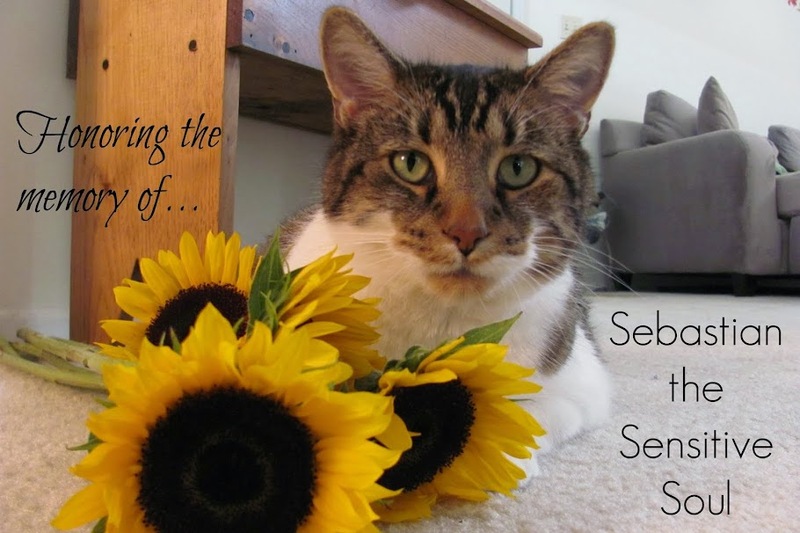 I went knowing that I was about to make some changes to the blog; namely, switching from Seb's voice to mine. The only thing I did ahead of time that would have signaled the upcoming change was to add my name to my business cards, rather than Sebastian's. I was excited to see friends and get motivated for a fresh start. I arrived on Thursday, a day later than many of my blogging friends. I was picked up at the airport by Connie (my roommate for the weekend) of Tails from the Foster Kittens and Lisa from A Tonk's Tail. 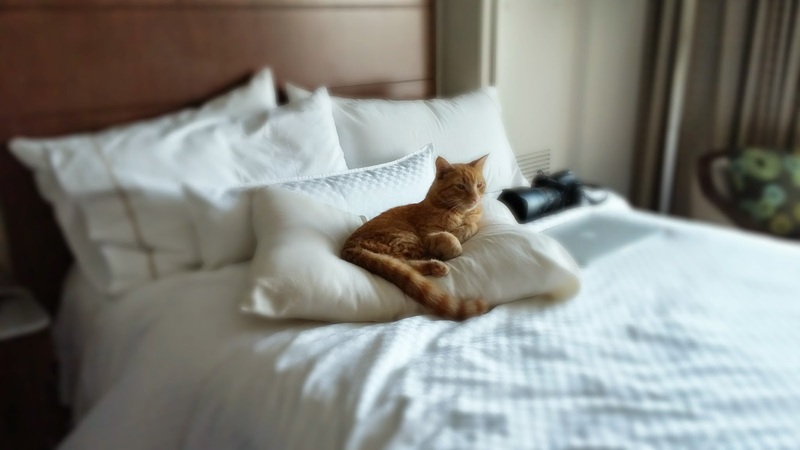 After settling in, Connie and I went to Lisa's room, where she was rooming with GloGirly and Waffles. 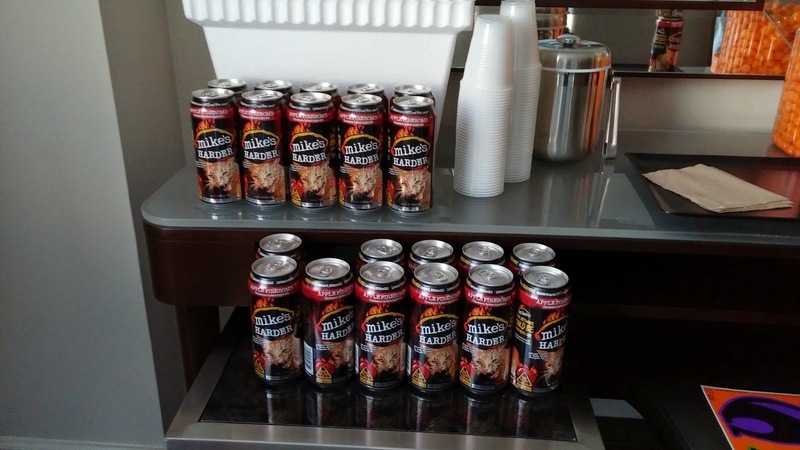 We got to try the new Mad Kitty Cocktail from mike's HARDER and meet the Mad Kitty himself. 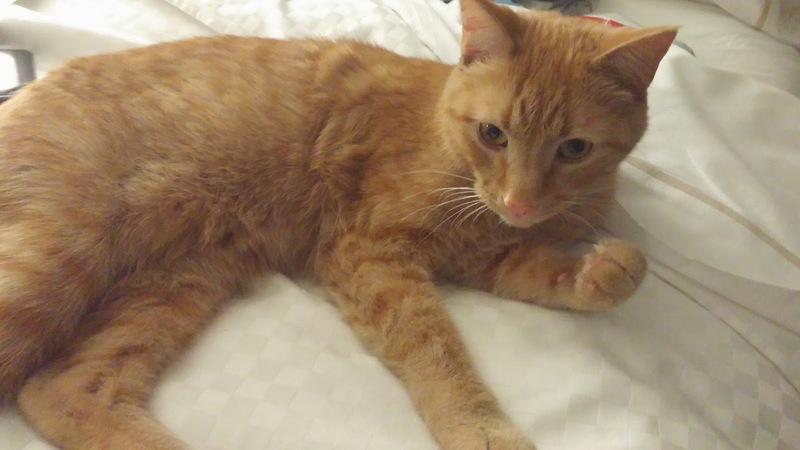 I was starstruck and crushing a bit on this handsome orange boy. Big thanks to mike's for providing the adult beverages. Later that evening the four of us went to dinner at True Food Kitchen across the street from the hotel. The restaurant's menu is based on an anti-inflammatory diet. There were lots of selections whether you wanted vegetarian, vegan, or gluten-free. I went for the turkey lasagna and pomegranate limeade. I wasn't sure the lasagna was going to hold up to my standards, but wow! It was good! 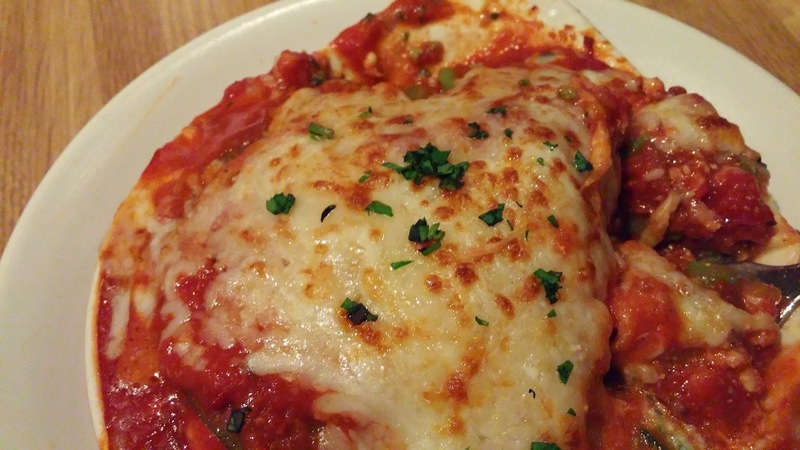 Just as cheesy as you would expect lasagna to be. After dinner, we stopped by Sprinkles Cupcakes inside the mall. You've got to have dessert while on vacation! I went for the dark chocolate and it was amazing. So amazing that I didn't even get a picture. We went back and hung out with Waffles a little while longer before going to bed. It was like a grown up slumber party-chatting, laughing, and catching up. Definitely a great start to the weekend! Check back tomorrow for my summary of Day 2! The time has come for me to step down as the voice of my blog. I have been at the Bridge for over 2 years now and I'm ready to focus on my time here while I wait for Mama. I have enjoyed making friends here and I'm ever so grateful for all of my readers. This does not mean the blog is going away. As a matter of fact, Mama will be the one to take over. 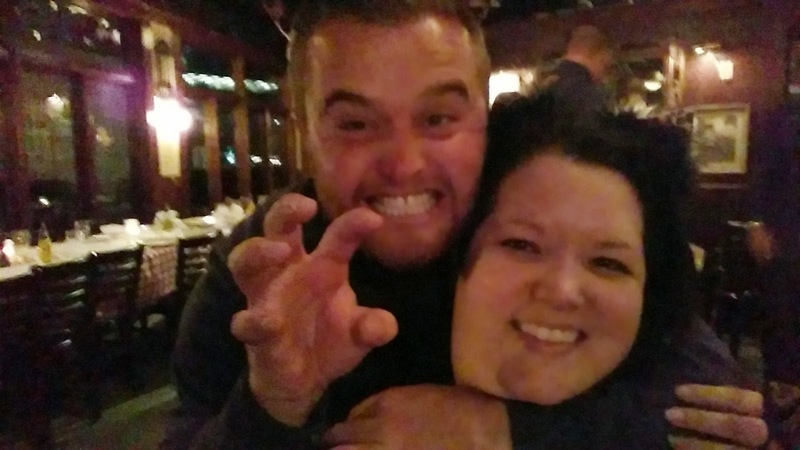 She is the one who has always told me about the homeless pets I have featured and she is very dedicated to making life better for pets across the Kansas City metro. Now, she'll be able to pass that all on to you directly. My star still shines brightly in the night sky and I will forever watch over you all. Mama cannot express how much she loves to hear people say that they remember me, so she will keep my memory strong right here. 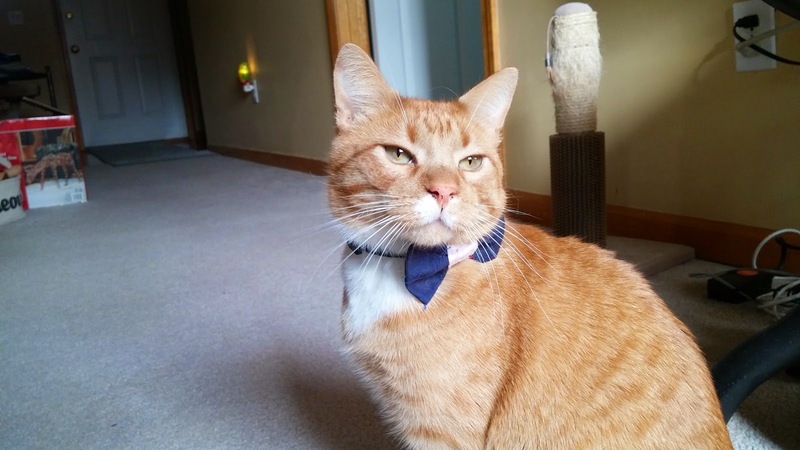 I'll still be around on Facebook and Twitter, especially for ReadPawty every other month. Thank you for following along as Mama continues this journey.